In the Wisdom Circle I’m part of, conversation flows along tangents into topics that interest us or challenge our pursuit of a relevant secular spirituality. Whatever arena we wander into, it’s not just a new perspective we’re after, but some kind of meaningful and responsible course of action. Given such-and-such, what can we do in the interest of greater honesty, integrity, and effectiveness? Our objective in every case is to clarify how a fully engaged spirituality might affect or transform the way we live in this world. I am reminded of the diagnostic matrix used in conventional psychotherapy for identifying and treating a client’s peculiar form of suffering. Typically a strong and overwhelming feeling of unhappiness is what first motivates an individual to seek professional help, and it’s here that interpretation begins. And as such feeling will commonly exert either a suppressive or compulsive effect on behavior, sapping one’s drive or spurring conduct that only adds to the problem, any counselor who’s paying attention will also look carefully at what the client is doing. After the linkage between feeling and behavior has been established, the task of therapy becomes one of bringing to light the associated thoughts and beliefs which have the client locked in a mindset that is perhaps irrational, unrealistic, juvenile, or delusional. As thinking provides an overlay of commentary on suffering – adding justification, self-judgment, conspiracy theories, or just more confusion to the pain – it is necessary to get this storyteller out of the closet and into the light of interrogation. It is hoped that by changing up the mental script a client will begin to feel better about things, start acting differently, and thereafter produce more positive results. In the diagram above, a red line from feeling to doing represents that irresistible impulse to act in ways that perpetuate or amplify an individual’s suffering. The curved green line is meant to illustrate that elevation into thinking which will expose the faulty logic and distorted beliefs keeping it all in play. Higher elevation into thinking involves the individual in more rational reflection and discrimination, where the driving narrative of one’s personal myth can be analyzed, updated, and strategically modified. In our Western psychology of mental health, these three correlates – feeling, doing, and thinking – form the ‘holy trinity’ of therapy. The better therapies work with all three in a more or less balanced way. Nevertheless, each one has also been favored over the others in the major schools of medicinal (feeling), behavioral (doing), and cognitive (thinking) therapy. Competition among these schools has prompted research into which modality is superior, or what combination of factors represents our magic door to mental health. Interestingly enough, the research has shown all of them to be about equally effective, and maybe the results improve a little when they are combined in some way. But ‘effective’ here doesn’t mean significantly effective. In fact, they perform just slightly better than placebo and often come with side-effects no one wants. Research consistently bears out the greater influence of another factor, quite apart from the specific treatment protocol: The quality of relationship between therapist and client (called the therapeutic alliance) proves to be the real magic door. Any why is that? 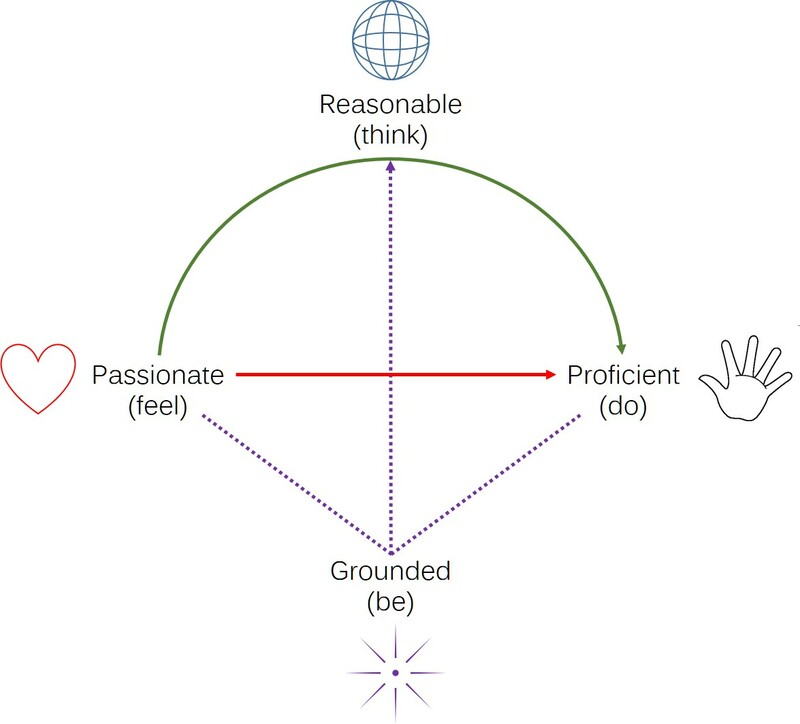 In my diagram, the deeper essence of this fourth factor is identified as the individual’s sense of grounding in a reality that is supportive and provident. Obviously, a therapist (or anyone else) who is welcoming, trustworthy, empathetic, insightful, and encouraging will demonstrate such a reality to the client. The ‘alliance’ part of this involves an individual in gradually calming down, finding ground, getting centered, and opening up to the other person. The more open a client becomes, the more confirmation he or she receives that reality is provident and supportive, which in turn encourages an even deeper release and a larger horizon of faith. This is the dimension of being (be). This factor of grounding offers a fourth correlate in a more complete picture of mental health and happiness. Changing how we think with talk therapy, how we feel with drug therapy, and/or what we do with behavior therapy is not enough. I have drawn lines from each of these three to the grounding mystery within, because it’s only as they are internally grounded that our thoughts, feelings, and behaviors can be genuinely creative. Otherwise, insecurity will tend to hijack our faculties and generate a delusion of our separateness (isolated, exposed, defensive, critical, judgmental, etc.) – where true happiness is impossible. You’ll notice that the line between think and be is actually an arrow, from the latter to the former. Because thinking is the mental activity by which we construct meaning and build out a worldview, it is vitally important that its product (i.e., our perspective on and orientation in reality) is properly grounded in the way things really are. No doubt this reveals my cognitive bias, but enough of my own experience and observation of others has convinced me that until our thinking is reality-oriented and the meaning we construct is sufficiently clear-sighted to acknowledge that the grounding mystery cannot be captured in words or theories, we will tend to become prisoners of our own convictions and fall that much farther out of touch. By the time that happens, how we feel and what we do have been commandeered by a distorted, outdated, and dogmatic orthodoxy. A human being is a human manifestation of being, an expression of the grounding mystery in human form. The wonderful thing is that each of us can contemplate and release ourselves to that deeper mystery at any moment. Ideally we live our lives as passionate and reasonable people, growing ever more proficient in the skills that help us be successful individuals, partners, parents, community members, and citizens. The big question has to do with the degree in which we have realized our full potential, evolved our consciousness, and found our way back to the place it all begins, right here and now.